It took a rare error to deny RML a strong showing in qualifying ahead of this weekend’s fourth round of the 2008 Le Mans Series at the Nürburgring in Germany. During final practice ahead of Saturday’s twenty-minute qualifying session the team’s MG Lola EX265, with Thomas Erdos at the wheel, had demonstrated excellent pace and every chance of a top-three start. In the end an uncharacteristic mistake in tyre selection ahead of those critical minutes, combined with unexpectedly high track temperatures, placed the task beyond even the reach of the talented Brazilian. “We made a mistake in tyre choice, simple as that,” conceded Phil Barker, team manager of RML’s Le Mans sportscar programme. “We elected to run on the softer compound after a good performance in practice this morning. We knew that the ambient conditions would play a part in how effective that choice became, but we didn’t expect the track temperature to have risen to such an extent by the time qualifying began.” During the morning’s hour-long practice session, the MG had run a strong fourth in class, and Thomas Erdos had been confident of finding more pace given the opportunity. In the four hours between that ending, and the start of qualifying, the surface temperature of the track had risen a full fifteen degrees. Relatively early during that same interval the team had also needed to commit to their choice of tyres. “Under those conditions it was very difficult for Tommy to set a representative time. He was contending with major oversteer and didn’t stand a chance,” concluded Barker. 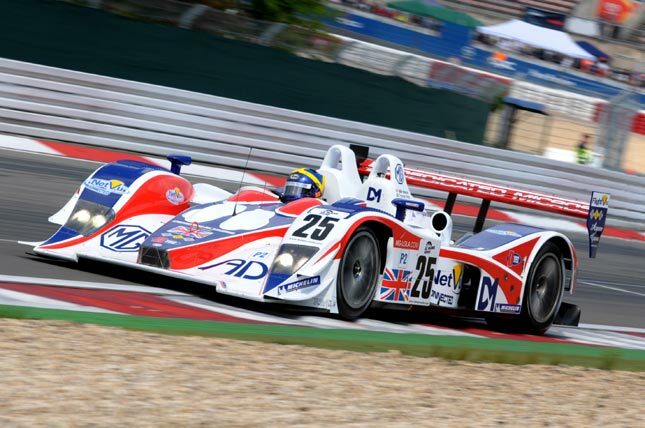 During the opening minutes Erdos had been holding third in LMP2, but was seriously delayed by a much slower LMP1 car on his second flying lap. Having missed his best opportunity at a quick time he was forced to abort the run. “After that the oversteer grew progressively worse,” he suggested. “It caught me very much by surprise. After the final session of practice, we expected to be very competitive, and felt we could aim for a top three, so it is very disappointing to be so low down the grid. The team had done a cracking job in preparing the car, and I felt we had things within our grasp, so I’m totally gobsmacked by this outcome.” His best of 1:45.903 means that the MG will now start tomorrow’s race from a lowly ninth in LMP2. The race is scheduled for 195 laps, and with outright pole falling to the #7 Peugeot 908 driven by Marc Gene and Nick Minassian in a time of 1:39.492, it seems likely that the race will run to the full six hours. The chequered flag is scheduled to fall at 18:05 central European time. For in-depth coverage of all free practice sessions and qualifying, see Friday and Saturday reviews. There are high resolution images posted in the Nurburgring Gallery.